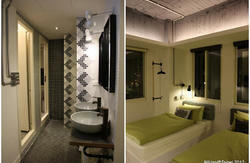 Starting from the Space Inn, guests can completely feel the convenience of transportation in Taipei. It is located at the most popular area for the young in Taipei- Ximen Area. Ximen Station is on the Blue Bannan Line that goes across Taipei metropolitan east to west, and that guests can go shop at SOGO shopping district within 10 minutes. NTU Hospital Station is on the Tamsui Line that goes north and south, and that guests can go eat the famous fish balls in Tamsui within 50 minutes and arrive at Taipei 101 within 20 minutes. Guests can also walk to Taipei Main Station and take the high-speed rail to get to Kenting to enjoy the summer or Sun Moon Lake to experience the dreamy fog. In this section there are 20 rooms for gentlemen. There are 4, 8, 9 and 10-bed rooms, satisfying the needs of individual trip or group tour for buddies. In this section there are 13 rooms for ladies. 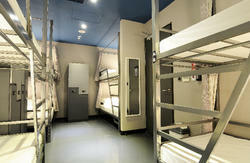 There are 4, 6, 8 and 10-bed rooms, plus a 12-bed room which is the biggest in the hostel. Invite all your good friends. If you are a group of friends consisted of both guys and girls, we also offer 4, 6 and 8-bed rooms. You can enjoy conversation before bed time all you can, but be sure to keep the voice down. Bannan Blue Line and Xiaonanmen extension. Get off at the Exit 3 at Ximen Station. 5 minutes walk to the destination. 2. Taiwan Railways: After arriving at Taipei Main Station, transfer to MRT Bannan Blue Line or Xiaonanmen extension to Ximen Station. 3. High-Speed Rails: After arriving at Taipei Main Station, transfer to Taipei MRT or bus. 4. Bus: Take 15, 18, 22, 220, 247, 257, 276, 287, 513, 621, 938, 640, 835. Chongqing branch to 228 Peace Memorial Park. 5. Taoyuan International Airport: Take the airport shuttle bus at the southwest side of the arrival hall on the 1st floor of Terminal 1, or the northeast side of the arrival hall of the 1st floor of Terminal 2 to Taipei Main Station and transfer to MRT or bus (information on airport shuttle bus). 6. Songshan International Airport: Take the Neihu Line of MRT and transfer to Bannan Blue Line to Ximen Station. 7. By car: Highway No. 1 ? Chongqing North Road interchange ? On Chongqing North Road, go toward the center city area ? Make a right turn on Hengyang Road.